Author Autar KawPosted on 6 Jul 2017 9 Jul 2017 Categories Numerical Methods, RegressionTags linear regression, Regression, sum of residuals1 Comment on Sum of the residuals for the linear regression model is zero. In a series of bringing pragmatic examples of the effect of significant digits, we discuss the influence of using default and scientific formats in the trendline function of Microsoft Excel. This is the second example (first example was on a beam deflection problem) in the series. Recently, I had assigned a project to my class where they needed to regress n number of x-y data points to a nonlinear regression model y=exp(b*x). However, they were NOT allowed to transform the data, that is, transform data such that linear regression formulas can be used to find the constant of regression b. They had to do it the new-fashioned way: Find the sum of the square of the residuals and then minimize the sum with respect to the constant of regression b. However, the solve command gave some odd answer like log(z1)/5 + (2*pi*k*i)/5. The students knew that the equation has only one real solution – this was deduced from the physics of the problem. What char command does is to convert the function dbsr to a string, inline constructs it to an inline function, vectorize command vectorizes the formula (I do not fully understand this last part myself or whether it is needed). 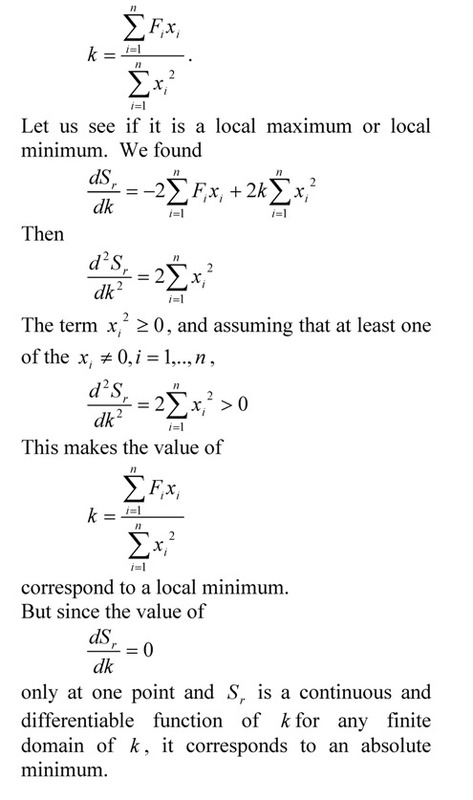 Author Autar KawPosted on 7 Aug 2011 27 Jul 2011 Categories Numerical Methods, RegressionTags exponential growth, MATLAB solve, minimizing sum of square of residuals, Regression1 Comment on Does the solve command in MATLAB not give you an answer? Many regression models when derived in books only show the first derivative test to find the formulas for the constants of a regression model. Here we take a simple example to go through the complete derivation. Author Autar KawPosted on 3 Aug 2009 21 Aug 2009 Categories MATLAB programming, Numerical MethodsTags matlab, Regression2 Comments on How do I do polynomial regression in MATLAB? Many a times, you may not have the privilege or knowledge of the physics of the problem to dictate the type of regression model. You may want to fit the data to a polynomial. But then how do you choose what order of polynomial to use. Do you choose based on the polynomial order for which the sum of the squares of the residuals, Sr is a minimum? If that were the case, we can always get Sr=0 if the polynomial order chosen is one less than the number of data points. In fact, it would be an exact match. Let’s look at an example where the coefficient of thermal expansion is given for a typical steel as a function of temperature. 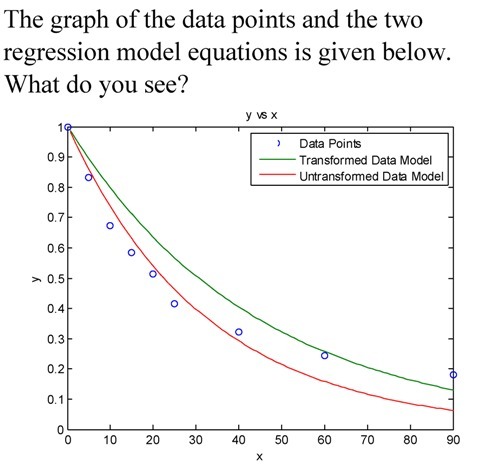 We want to relate the two using polynomial regression. So what order of polynomial would you choose? 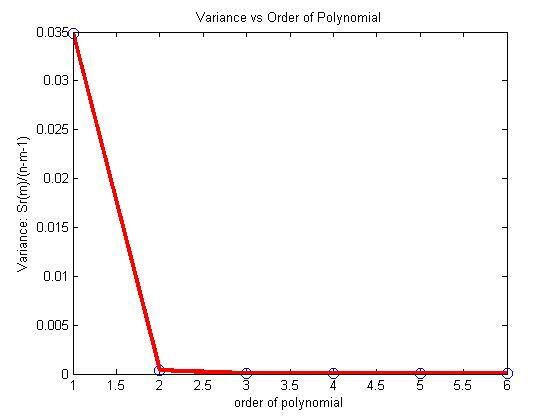 From the above table, and the figure below, it looks like the second or third order polynomial would be a good choice as very little change is taking place in the value of the variance after m=2.